Didn't I just publish a post about an Oskunk creation? Oh, yeah, I did. Oops. What can I say? I like the guy's work. 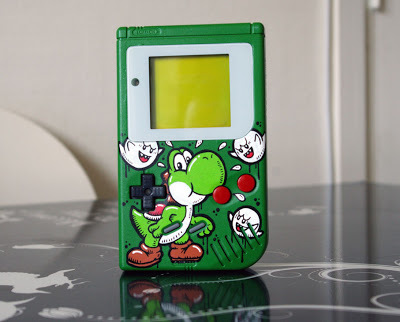 And, really, how can you not like a GameBoy that's been custom painted in order to honor Yoshi? To see the backside of this particular GameBoy (and to see both sides from a few different angles), be sure to check out this post on Oskunk's Custom Art blog at your earliest convenience. Wow, I'm kind of surprised to hear that, Justin! I mean, I like it a lot, too, but I probably wouldn't say it's my favorite. That said, if you like green and you like Yoshi, you're sure to love this system, aren't you?